After 10 days of hard work moving my mother-in-law out of her home, packing up and distributing most of her worldly goods, cleaning the entire house, moving a few carefully selected pieces of furniture and decorative items into her new care home, arranging them, hanging photos on walls, and visiting her for 2 hours each day for almost all of the 10 days she has been there...well, you can imagine! So, friendship time with a dear friend.... and a trip to Whiskey Hill, in Hubbard, Oregon.... and the Zion Mennonite Quilt Workshop and Show. It is a simple show, but so sweet, and always has some vintage quilts with great charm, a wonderful home cooked meal for the cost of a simple donation and a lot of fun with a good friend/s! What I also love is the absolute charm of seeing some of the older Mennonite quilters still hand quilting and teaching others their special techniques after all of their years of making quilts and quilting. And I really love knowing that this was the original group of Mennonite women quilters who first worked with Gwen Marston, decades ago, and taught her to quilt. She has written about them in one of her books and described their skill and their patience. Back then it was all with simply drawn pencil on cardboard templates and they have boxes and boxes of them, still. We are welcomed to trace as many as we want, but it is, of course, the fun of just seeing these vintage pieces that is the most fun. The same is true of the quilts. One from 1917 with a later dated of 1957 added. I wondered out loud..."I wonder if it took the quilter that long to hand quilt and finish it?' and a stranger next to me answers..'it would have taken me a heck of a lot longer that than!" My friend, Pat, and I wandered the rows looking at the older quilts mixed in with the newer ones, with old sock monkeys, and simple yo you dolls, sitting in vintage strollers and high chairs while modern lamb toys and a teddy bear cozy up to other pieces. The merging of the old and the new is reflected in all of our faces. 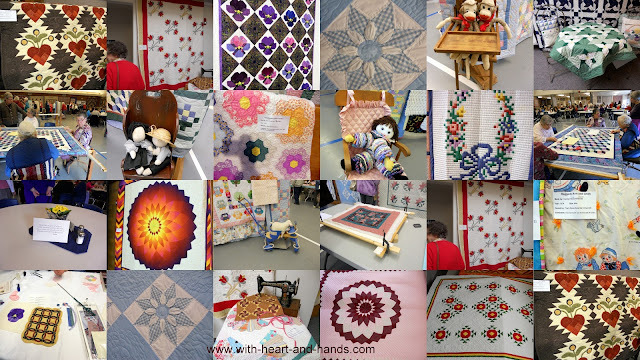 A beautiful Mennonite woman hand quilting in her traditional sheer bonnet, while the middle aged in quilted jackets and vests, merged with the new young quilters and the tiny tots played with scrap fabrics on the long tables. A place for everybody and every kind of quilt. I am reminded of the last time I had the chance to attend this workshop..back in 2007. 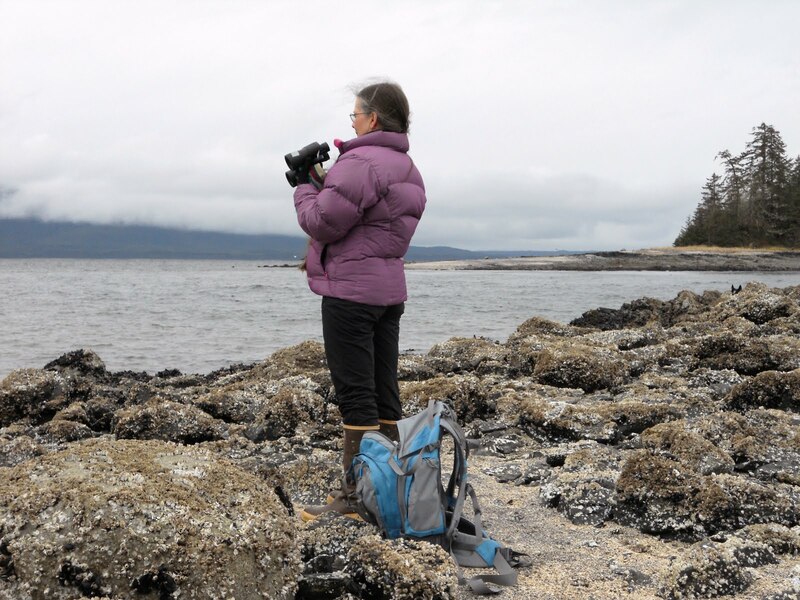 We had one adventure after another and I was driven to write one of my poems. This one uses the names of quilt blocks to describe our day...I reread it n now and still think I was clever..haha...at the time to come up with it. Yep, a fun day of escape. My friend still processing the changes in her life, as I process the changes in mine. Losses come in all shapes and sizes. Sometimes we lose a loved one to illness and sometimes the loved one faces a loss in independence and the ability to live in their own home. I am grateful I was able to put all of the 'need tos' and 'have tos' aside and take a day just for smelling the roses. Even if the roses were fabric, they were just as colorful and just as sweet. 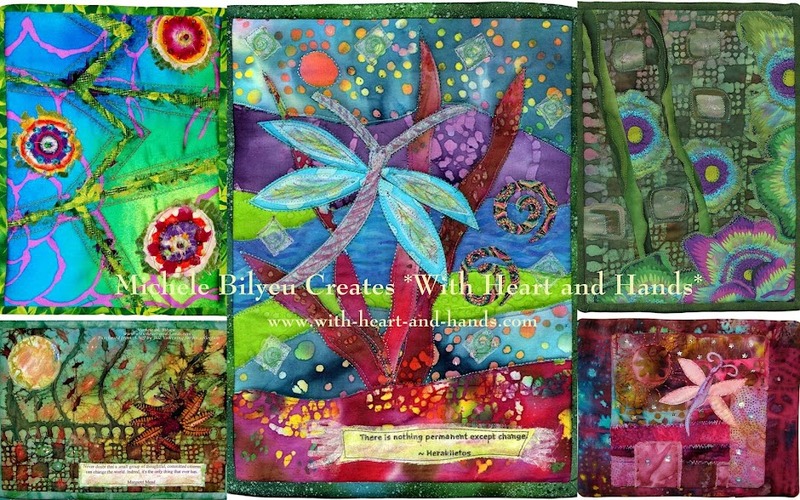 Michele Bilyeu Quilts With Heart and Hands where she offers links to over 2,500 free quilt patterns, shares her love of quilts, and quilting for charitable causes. 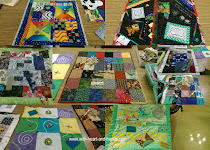 As a volunteer quilter for the Alzheimer's Art Quilt Initiative (AAQI) she started the Liberated Quilting Challenge...and invites others to buy or donate a quilt, today!! We are changing the world...one little quilt at a time. Thanks, Angie! You are always so nice and supportive! And yes...it was good to get out. We had sunshine in Oregon, today, and that was a real treat! What a wonderful way for both of you to take some time out. What a great old fashioned kind of show. I think I'd like this even better than a lot of the ones I've been to!